Shoes are a very individual thing. What works for me, may not work for you. 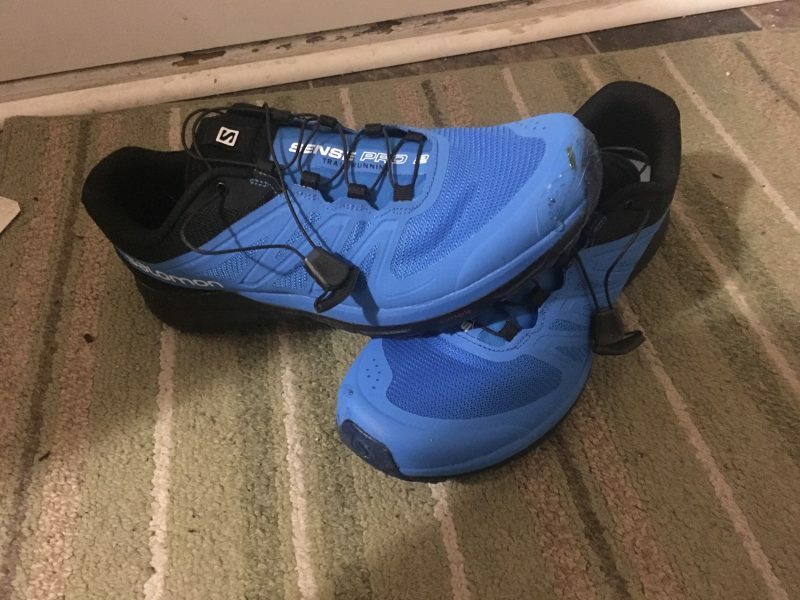 With that note, let me tell you a bit about how I run and the shape of my feet to help you decide if my experience with the Salomon Sense Pro 2 might match up with your experience. First, I have wide feet. Like 2E wide. That means many shoes don’t fit me, or I split them quickly. Specifically my left foot went through my Salomon SpeedCross 4 (non-gortex) within 100km of running. Second, I land on my forefoot. I heal strike a bit only when I’m trying to scrub speed coming down steep hills. Really that’s it so let’s dive into the Salomon Sense Pro 2. I’ve got just over 120km on these shoes so far. I’ve had them out in snow and ice. I’ve taken them on the road and on muddy trails. In all conditions they’ve performed as well as I could expect. I was initially skeptical that I’d get the same grip performance I had from my Salomon SpeedCross 4’s. The tread on the Sense Pro 2 is nowhere near as aggressive. In practice though it hasn’t been an issue. They offer just as much traction in all the trails I’ve been on in South Western BC. These are trials just like those you’ll find in the Pacific NorthWest of the United States. Muddy, rainy, green and slippery. At no point did I ever feel that the lack of traction had anything to do with the shoes. Yes I put on MicroSpikes, but I would have used them at the same spot with my SpeedCross shoes as well. In fact, it was way easier to get the spikes on the Sense Pro 2 because of the lack of huge lugs. I mentioned earlier that I tend to split shoes on the outside because of my wide feet. With over 120km in the Sense Pro 2, I see no signs of wear at all. The only thing that I had as far as a bad thing with the Sense Pro 2 was learning to lace them to the correct tightness. My first few runs I had them over tight and ended up with the outside of my feet being sore. I had to loosen them off and then the problem went away. At $140 retail, these shoes are a steal. I’ll be retiring a pair of my SpeedCross 4 shoes and in the future I’ll likely stick with the Sense Pro 2 by Salomon. One thing I still don’t know how to deal with is the lack of a waterproof Sense Pro 2. For now I’ll keep my GorTex SpeedCross 4’s for those high mountain snowy runs that are common in the spring. It’s not a grip issue, I just want warmer drier feet.